The existence of a new Spider-Man 2099 series is one of those fun little paradoxes of the comic book industry in that I never truly realized a 20-plus year-old book still had enough of a following to warrant a new beginning, while simultaneously I’m sorta shocked it took so long (nearly a year after Miguel O’Hara was introduced in Superior Spider-Man) for a 2099 redux to be released. 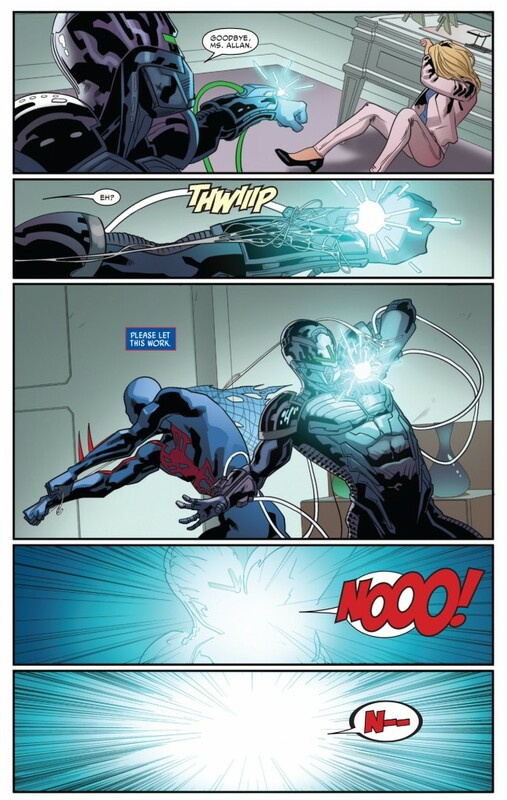 But here we are – July 2014 – and yes indeed, Spider-Man 2099 #1 (vol. 2) has arrived, begging the next big question: was it worth the hype/wait? 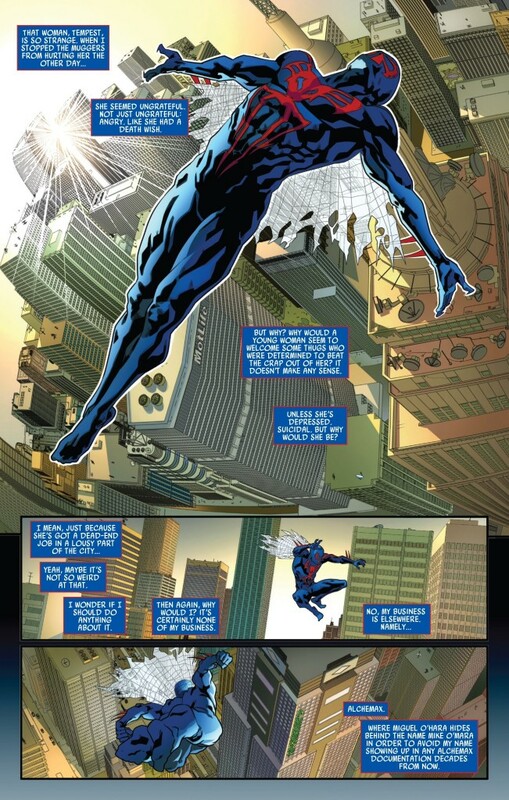 Part of what made the original run of Spider-Man 2099 such an enjoyable experience was how its creators, Peter David and Rick Leonardi, managed to craft this wholly unique universe filled with quirky and likeable characters (despite the dark, dystopian setting) to go along with completely original stories. 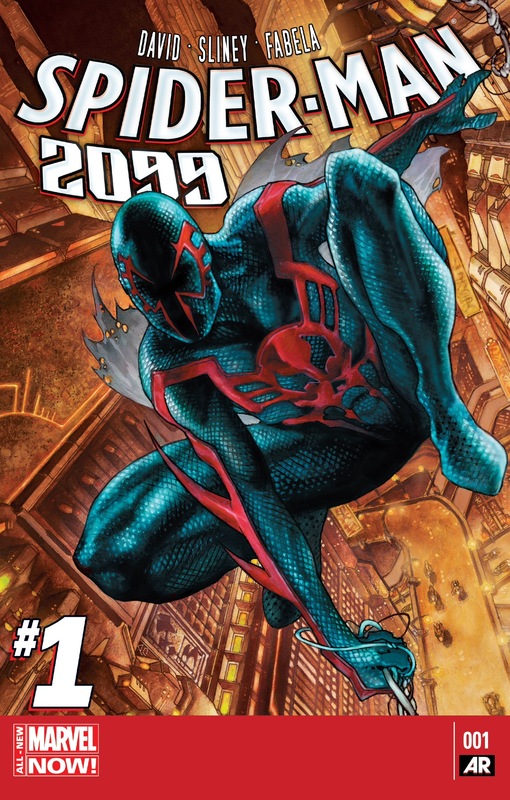 There were definitely some parallels between the 2099 version of Spider-Man and his modern-day counterpart (who in the early/mid-90s was fighting android versions of his parents and later, his clone), but a person could crack open a copy of Spider-Man 2099 and be transported to somewhere that was also very different and disconnected from the 90s-ification of Peter Parker. In other words, it’s another paradox. A “Marvel of the future” filled with flying cars, cyberpunk gangs and evil, world-dominating corporations was a concept that could have only been given birth in the 1990s. Yet, all the same, the way David and Leonardi crafted their story, Spider-Man 2099 was the most un-90s comic to be published in the decade (well, until Kurt Busiek and Untold Tales of Spider-Man came along). Fortunately, my fears and concerns proved to be misguided. The first issue of the newly relaunched Spider-Man 2099 was everything I needed it to be in terms of a reintroduction and set-up of this gem of a universe. The opening page of the comic reintroduces arguably one of the best supporting characters from the original series – Miguel’s hologram/security guard/helpful assistant Lyla. Part of what made Lyla such a fun character the first time around was how David injected an otherwise inanimate object with the personality and sense of humor of an actual person. Lyla’s characterization demonstrated that David was paying attention to every little bit and piece that was written into his book – nothing was superfluous which is a broad, industry-wide problem with comics. People and objects are introduced primarily as a means to serve the main character’s plot. But David saw to it that even a character like Lyla, who was more of an embellishment rather than a plot-driver, warranted layers. For vol. 2, Lyla throws the quips down in rapid-fire succession, whether she’s verifying that the red stain on Miguel’s new apartment floor is actually blood, or by changing O’Hara into a tuxedo rather than his Spider-Man 2099 duds (he did look nice in a tux). From there, David works masterfully with his new cast of characters, looking to give them all their own distinct personalities and quirks. Tiberius Stone, Miguel’s biological grandfather who had been treated primarily as a mustache-twirling, manically-laughing bad guy by Slott in last year’s Superior Spider-Man arc, is readily established by David as O’Hara’s chief adversary, much in the way Tyler Stone was in the original 2099 story. We don’t get a ton of Tiberius in this story, but we get just enough to whet or appetitive and bring to our attention that this guy is more than just your stereotypical evil genius/manipulator. Like everyone else in this book, there’s a natural charisma to Tiberius with David at the helm that makes me want to read more about him. Then there’s the enigmatic pink-haired Tempest, who had a curious introduction in an Amazing Spider-Man #1 “B” story. Miguel is struggling with her ambivalence-bordering-on-resentment of his saving her from a group of thugs in this previous story, but in Spider-Man 2099 #1 we catch some glimpses of her personality that make her a bit more engaging. Her repartee with Miguel is highly entertaining (Miguel’s “up yours and thanks!” is a standout line in the book) and groundwork is clearly being laid for Tempest to either be a potential love interest or a fun ally for Miguel. Slott’s reintroduction of Harry Osborn’s ex-wife Liz Allan in Superior seemingly raised more questions than answered about what she’s been up to since she was last seen asa solid supporting cast member in the Spider-Verse. It appears that Spider-Man 2099 is going to be the place where we learn a little bit more about Allan, and how she came to run a large chemical company (not to mention the skeletons she has in her closet). I’m assuming her initial subplot is going to feature her trying to figure out which one of her employees is operating as this new Spider-Man (the fact that she put two-and-two together so quickly already makes Liz smarter than about 99 percent of all characters in comics). Again, not to keep beating on this drum, but I’m intrigued to see where things go with this character. Actually, the only thing in this comic that felt a little been there/done that for me was Miguel’s opening confrontation with the future time cop T.O.T.E.M. (curiously enough, from the year 2211, where there’s another Spider-Man lurking around and who I’m anticipating will be in “Spider-Verse” this Fall). I did read one reaction piece where the author was bothered by the way Miguel so callously killed T.O.T.E.M. during their battle but A) these actions are totally in-line with how Miguel operated in his first series B) we didn’t actually see a corpse, so who’s to say the guy isn’t just in a timestream somewhere and C) because of how spot-on everything else was in this issue, I’m going to give David the benefit of the doubt that Miguel isn’t some remorseless killer/anti-hero. With all sincerity, much like the 1992 rendition of the series, Spider-Man 2099 #1 is about as good of a debut issue as you get in comics these days. I’ll be curious to see how this book sells at the end of the day, but hopefully the people that were apparently clamoring for more Miguel will put their money where their mouth is and turn this project into a success. Except Spider-Man of 2211 was killed by none other than Uncle Ben! Great review, I completely agree. It was seriously like Peter David never quit writing the character, which is really impressive considering it’s been around 20 years since he last wrote Miguel. Nice review man. I’m exited for this series just as much if Spider-Man Noir had it’s own series. Still waiting for that day. Also do you scan those pictures from your collection, find them online, or you buy the comics digitally and just screen shot it? The vast bulk of my images come from iPad screen grabs. Between the ease of doing, plus the high resolution, there’s no better way.